Across the country, parents and community leaders fought a long struggle against school segregation. With little money or public support, they argued their cases before white judges and all-white school boards that had little sympathy for their concerns. The stories here outline three examples of the legal battles in the long fight that eventually led to the U.S. Supreme Court. In the 1840s Benjamin Roberts of Boston began a legal campaign to enroll his five-year-old daughter, Sarah, in a nearby school for whites. The Massachusetts Supreme Court ultimately ruled that local elected officials had the authority to control local schools and that separate schools did not violate black students’ rights. The decision was cited over and over again in later cases to justify segregation. Black parents in Boston, however, refused to accept defeat. They organized a school boycott and statewide protests. In 1855 the Massachusetts legislature passed the country’s first law prohibiting school segregation. 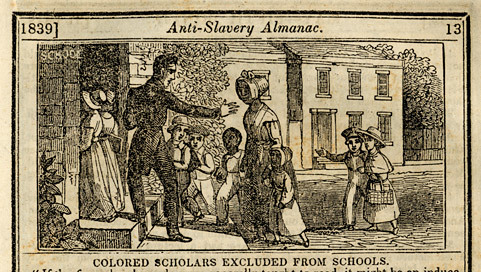 This image, entitled Turned Away from School, appeared in the Anti-Slavery Almanac in 1839. Robert Morris was one of the country’s first African American attorneys, and Charles Sumner was a leading abolitionist lawyer. They represented the Roberts family in their suit to end segregated schools. The arguments of the two attorneys echoed through the Brown v. Board of Education case more than 100 years later. In 1884 Joseph and Mary Tape attempted to enroll their daughter Mamie at Spring Valley School in San Francisco. Principal Jennie Hurley cited school board policy against admitting Chinese children, and the Tapes took the case to court. On March 3, 1885, the California State Supreme Court said that state law required public education to be open to “all children” and ruled in favor of the Tapes. After the decision, the state legislature quickly passed a law allowing schools to establish separate facilities for “Mongolians.” Other Asian parents continued the fight for integrated schools until their eventual victory in 1947. This photograph of the Tape family shows Mamie in the center. The separation of the schools, so far from being for the benefit of both races, is an injury to both. It tends to create a feeling of degradation in the blacks, and of prejudice and uncharitableness in the whites.